The common bond is the factor which unites the members of a Credit Union together, this relates to those living or working in the same area. It defines the area in which a credit union can operate. 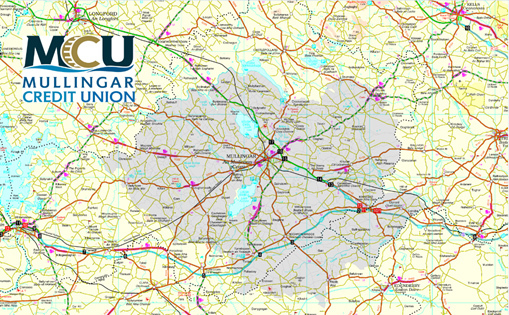 The common bond area of Mullingar Credit Union is shown on the map below. We want you to be a part of Mullingar Credit Union so if you live, work, or attend school within the common bond, or live with a relative that is already a member, you can join today! Convenient and flexible loans at low interest rates. Deposit Guarantee Scheme – find out more here. Loan Protection and Life Savings Insurance at no direct cost to the eligible member – find out more here. Open Tuesday to Saturday and late night opening on Thursday night (Mullingar Office).